With the recent rise in Shark attacks both in Australia and other parts of the world Sarah Loughlin finds out just how Sharky it really is out there. The most dangerous thing about surfing in Jersey was the chocolate milkshakes from El Tico’s. Those things were seriously addictive. Learning to surf in the UK seemed a tremendous feat at the time, but looking back the worst thing that could happen was you would get a weaver fish, or be washed up on the beach a bit battered and bruised. Growing up in the England I had never given sharks much of a thought. But the recent move to Australia has bought these issues to the front of my mind. The week we moved over to the Gold Coast, a surfing mecca, was just after World Champion Surfer Mick Fanning was attacked by a shark in South Africa. Mick is from the Gold Coast, and can often be seen out on the water when he is in the area. What I probably look like to a shark. Just How Sharky Is It? There have been record numbers of Shark attacks in the last few years on both the West coast and more recently the East coast of Australia. In 2015 there were 22 recorded shark attacks on humans in Australia, this is double the amount recorded in 2014, and higher than the yearly average of 13. Of the 22 attacks, only one was fatal, and seven of the shark attack victims were uninjured. NSW has the highest rate of attacks with 14 recorded in 2015. Experts have many theories about why this might be, and are equally unsure as to how to deal with the problem. From increased helicopter patrols and lifeguards on previously un-manned beaches, to more controversial solutions such as shark culling and shark nets. Some reports say that one of the most influential factors to the increase in attacks is the increase in population. The more people there are in Australia spending time in the water, the more chance that a shark attack could occur. Before heading in to the water I wanted to find out exactly what I was up against so I caught up with Josh Fuller, a pro surfer who now runs his surf school from Kingscliff, NSW. One of the first things Josh explained is that is it a small selection of shark species that are normally involved in shark attacks; Tiger Sharks, Bull Sharks, and Great White Sharks. Most other species are completely harmless. Josh explained that there are risks involved with surfing, as there are with most sports, but if you take the time to learn about basic ocean safety you are more likely to enjoy surfing and stay safe in the water. One of the first Aussie phrases I came across moving over here was ‘Sharky’. Not commonly used in other parts of the world, I still wasn’t quite sure what it meant. ‘It’s more of a feeling’, explains Josh, ‘when the sky is grey and overcast, and the water looks really dark, it just feels sharky’. One of the first points covered in Josh’s ocean safety run down is to avoid surfing at dusk and dawn, as this is feeding time for sharks. After our pep talk on the beach I was ready to hit the surf. Heading out for a solo surf in Dbar, NSW. Sarah 1: Shark 0. Splashing about in the shallows in the warm, clear waters it was hard to imagine that there were huge predators swimming probably not that far away. Josh explained that although sharks are often close by, the number of attacks on surfers compared to the number of surfers is very low. After picking up a few tips from Josh on my technique and spending time in the water with a local, I felt confident that I could take to the beach on my own, but I still couldn’t get the thought of sharks out of my head. To get over my fear I wanted to see what was going on under the water, and get a feel of what might be lurking underneath me. I felt that if I could see one up close I wouldn’t be scared anymore. It’s more the fear of the unknown than anything else. Sort of like falling off your bike for the first time when your a kid, once you have done it, and it doesn’t hurt that bad, and you don’t have to be scared of it. Swimming with Sea Turtles @ Cook Island, NSW. Heading out on the boat to Cook Island, a local diving spot known for being a bit sharky, I had mixed feelings. I wanted to see a shark, but at the same time I felt like hunting them down was asking for trouble. Never the less I hopped into the water and sunk down with the dive instructor to have a look around. I will never tire of diving and seeing at the marine life going about their business, swimming about, its mesmerising. About 10 minutes in, almost forgetting why I was there, I saw one. Small, but most certainly a shark, it swam by in the distance, not giving us a second glance. After thinking of nothing but sharks for the last few weeks, it seemed almost an anti-climax to have the shark be so uninterested in us. I blame my irrational fear of Australian wildlife on being addicted to Steve Erwin’s TV show. Before I moved here I imagined that everything in Australia would kill you as soon as look at you. But with one fatal shark attack per year in Australia you are far more likely to come to a sticky end using a vending machine! To get out surfing on the Gold Coast visit in2surf.com.au and book your lesson! Having caught approximately three waves in my surfing career so far, here is one of my terrific paddling. Sarah Loughlin ventures to Taghazout to check out the world famous waves and the developing surf culture in the small Moroccan town. There is nothing in life both as thrilling and frustrating as surfing. After spending the winter battling through the frosty waves in the Channel Islands, trying to get the hang of this new hobby of mine, I thought I would take my own advice on learning a watersport and add a bit of sunshine to the mix! Taghazout, a small fishing village turned surfers paradise, is about an hours drive from Agadir Airport. Having never been to this part of Africa before I had no real idea what to expect. The village itself is bustling with people, cars and mopeds and the small square is surrounded by restaurants, and surf shops. The coast is not as picturesque as other places I have visited, but it has a great atmosphere; local families, tourists and surf schools all mingle together on the long sandy beaches. The snack-sellers on the beach are a bit intimidating at first, as they can be a bit pushy, but are actually very friendly and provide much entertainment with their haggling and joke telling. The macaroons and candied nuts they sell are perfect for a post-surf snack! As those who have been following my previous surf posts will know, I am not a great surfer, I am not even a good surfer. So I had arranged lessons via Surf Maroc; a surf school started by Ollie and Ben, two English surfers, back in 2003. 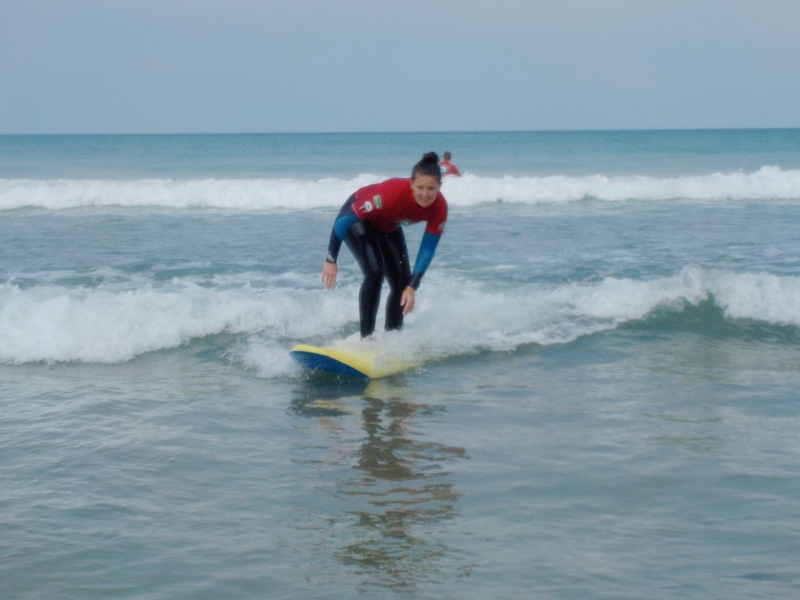 Our surf class was an interesting mix of nationalities and people from different professions and backgrounds. Chatting on the beach at lunchtime was almost as educational as the surf lessons as I learned about the best bars to visit in Krackow, and how the Swiss school system works. Being largely self-taught I have no concept of ‘surf chat’, and so for the entire first day I assumed wave ratings must be the same as ski slope ratings; green wave must mean beginner wave. I was mightily confused pushing myself into tiny white foamy waves as my teacher yelled from the beach at me to catch a green wave. On day two it clicked, green wave doesn’t mean beginner wave at all, it’s super cool surfer lingo for a wave that has not yet broken. You have to have good timing to catch these as opposed to white waves (the foamy ones), thus they are the mecca of intermediate surf waves. Part of my problem, like most of the beginners I meet, is that waves are terrifying. Going head on with a huge unbroken wave while attached to an eight foot cumbersome floaty board was seeming more ridiculous the more I thought about it. But I had got this far, board in hand, I was determined to make it out to find one of these sought-after green waves. Alas it was not to be, and I went back to the beach in search of some candied nuts. Back out in the surf again and I was constantly amazed at how patient and enthusiastic our teacher was with us, despite our consistent face plants into the beach. When my arms had run out of juice he even let me hold on to his ankles so he could paddle me outback to meet the rest of the group – now that is service! Surf Maroc employ a lot of local staff from Taghazout and surrounding villages; this helps improve the local economy and quality of life by providing jobs as well as offering training and opportunities for young entrepreneurs, who sometimes go on to open their own surf businesses. The teachers at Surf Maroc, who have all grown up surfing in the area, have great local knowledge which is huge benefit to the customers. They always managed to hunt down the waves, despite the forecast being not so great, and made sure we were in our wetsuits and out surfing before the beach got too busy. One interesting thing about holidaying here is that Taghazout is a dry town, as a European this is a bizarre concept. But actually it was quite nice, I drank more Fanta than dentists would recommend, but it is the perfect place if you are planning an alcohol detox! You can buy alcohol in some near by hotels such as the Paradis Plage who have a great beach bar as well as beach side yoga sessions. Outside Paradis Plage the locals bring their horses and camels and you can ride down the long peaceful beach. The surfing in Morocco was great, but it was nothing compared to riding a Camel on the beach at sunset, I felt like a Princess riding through the desert on my trusty steed (one can dream). If you like a post surf yoga session, Surf Maroc offer classes on their yoga balcony set into the cliffs at the Taghazout Villa. It was quite honestly the most relaxing place I have ever been. As the sun set over the sea, the sound of the waves crashing rhythmically into the cliff was the perfect accompaniment to the session. There is weekly schedule of post-surf evening entertainment at Surf Maroc , the BBQ on the balcony of the Auberge was a nice way to socialise with your surf group out of your wetsuit! 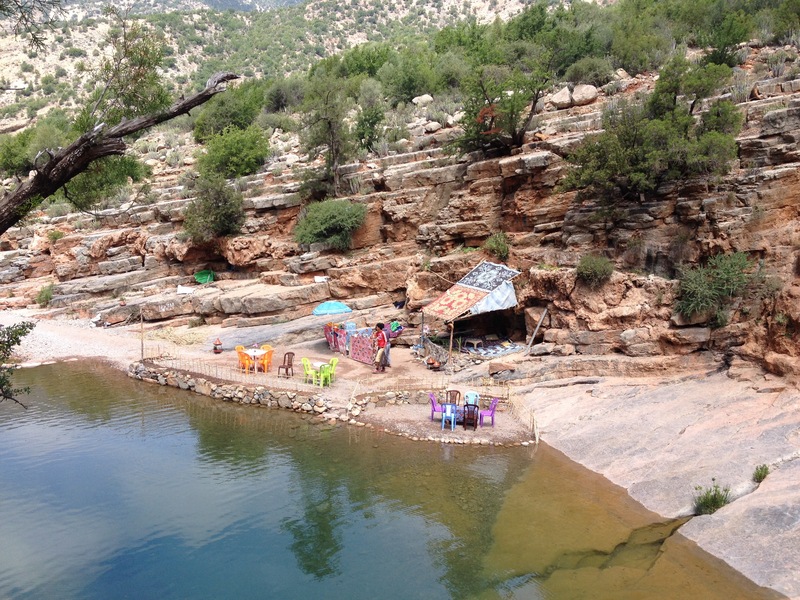 If your weary arms need a break from all that paddling why not head to Paradise valley; only a 45-minute drive from Taghazout. As you drive in to the valley there are cafes and restaurants dotted around next to the river with the tables and chairs in the shallow streams so you can keep your feet cool while you have a nice Fanta. A short hike from the car park at the top brings you through the trees into the valley, where you will find locals having big family days out, preparing and cooking their tagines on the rocks. There are also make shift shacks selling fresh tagines and cold drinks. You won’t be offered a menu, you just ask what they have (normally two different types of tagine! ), they are very good value and the food is great. Renting a car is very reasonable from Agadir airport, petrol is cheap and it’s not to difficult to navigate your way around. Make sure to keep some change handy for the car guards who will watch your car while parked in town or at the beach. If you don’t fancy driving, airport transfers are included in Surf Maroc’s packages and they offer excursions to Paradise Valley. The packages include everything but the flight which you will have to book yourself. If you are booking in advance try Easyjet for direct flights from the UK, or Thomson Flights can be really good for a last minute flight deal. The peak season for Surfing in Taghazout is November – April, so get booking for your mid-winter sunshine now for the best flight deals.